GMC Hosting is a Game Server Provider that is located in New York and that is ran by people from various backgrounds such as network engineers, web hosters and past community owners . We work to provide the best bang for your money even if it means paying more. We try to offer the lowest pings, best service and the best experience out of any game server provider in the US. All services are setup instantly and are monitored daily to ensure you are happy with your server. Honestly it started good at the beginning. However, within a week we were seeing quite a bit of lag within our servers which the host kept blaming on our gamemode. From what we could see, it was small query attacks that the host was denying. Since moving to another host, we haven’t had any issues at all using all the same scripts. I’d suggest staying away and looking elsewhere. If you would like a CSGO or Garry’s Mod server this would be the place suitable for you! ????? My experience so far with GMC is absolutely excellent. The customer support preforms in the best way possible and always gets your problem fixed. 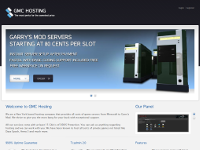 The prices are affordable and the servers out-preform.